El Dorado County Habitat for Humanity | El Dorado County Habitat for Humanity El Dorado County Habitat for Humanity - Get involved in your community! Founded in 1999, El Dorado County Habitat for Humanity was formed as an independent affiliate of Habitat for Humanity International serving El Dorado County. Our mission is to create successful home ownership opportunities for families with limited incomes by building sustainable housing and revitalizing neighborhoods. Earn an income between 40%-80% of area median income, as defined by the U.S. Department of Housing and Urban Development. Have a need for housing. Are willing to partner with Habitat for Humanity and contribute 500 sweat equity hours to the construction of their own home, or their neighbor’s home. 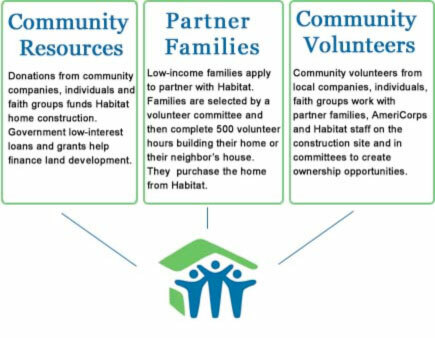 Based on these criteria our volunteer-based Family Selection Committee recommends families that will work to build a community of active homeowners. El Dorado County Habitat for Humanity approaches the challenge of providing affordable home ownership opportunities to low-income families in an innovative way. Affordable homes are built using a large amount of volunteer labor, donated funds and materials. Then the homes are sold at affordable prices to qualifying low-income families. Qualified families, selected on an equal opportunity basis, buy El Dorado County Habitat for Humanity homes at affordable prices, through 30-year zero-interest mortgages. In addition, each family contributes hundreds of hours of volunteer labor or “sweat equity” to the construction of their home. This “sweat equity” or “self-help” component of the program is a major investment on the part of the homeowner, and increases homeowner pride of ownership. “Sweat equity” can consist of home building as well as community projects and leadership development classes. Once the homes are sold to the partner families, the mortgage payments received by Habitat are then reinvested to help fund the construction of future Habitat homes.